Sullivan & Cromwell's Antitrust Group represents clients in litigation, government enforcement actions and dealings with competition law agencies in the United States, the European Union and around the world. The Group advises on merger clearances, criminal antitrust investigations and civil litigation. Because the same team is used, clients benefit from the Group's complete understanding of the issues clients face. This holistic approach is particularly important in coordinating global cartel investigations and responding to any subsequent civil litigation, a regular part of the Group's practice. In addition, despite heightened regulatory scrutiny, the Firm boasts an enviable track record securing U.S. antitrust clearances for U.S. and cross-border mergers, acquisitions and dispositions. 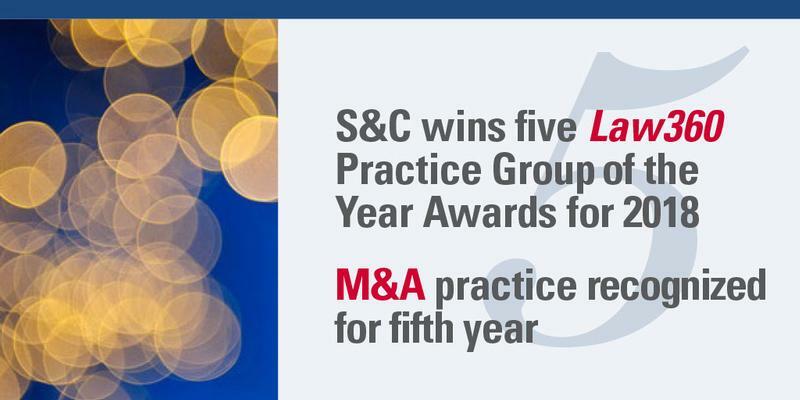 S&C lawyers also offer counsel on high-level business strategies; mergers, including related litigation; antitrust investigations; threats of litigation; and challenges to other companies' anticompetitive practices. The Firm handles all manner of international issues through its global network of offices. S&C nurtures long-term relationships with its clients, developing an in-depth understanding of each client's business and offering advice that is effective, pragmatic and tailored to its objectives. The Group blends demonstrated excellence in antitrust law with industry-leading positions in corporate, financial and transactional legal strategy. Dedicated teams tailored to the needs of each case move seamlessly among strategic advice, litigation and any required appeals. From start to finish, S&C lawyers master the complexities of the client's regulatory challenges. Bank of Tokyo-Mitsubishi UFJ, in investigations into potential irregularities in the setting of the London Interbank Offered Rate (Libor) interest rates. S&C also represented Bank of Tokyo in the related class-action litigations filed in U.S. federal court alleging that it and 15 other financial institutions manipulated Libor in violation of federal antitrust laws and the Commodities Exchange Act. Barclays, in international, multiagency investigations into benchmark interest rates, including Libor and Euribor. S&C was engaged by Barclays to conduct an internal investigation regarding conduct relating to benchmark interest rates. In 2012, Barclays entered into settlements with the U.S. Commodity Futures Trading Commission, the U.S. Department of Justice Fraud Division and the U.K. Financial Services Authority. S&C also represented Barclays in obtaining conditional leniency from the Antitrust Division of the U.S. Department of Justice with respect to financial instruments referenced to Euribor. S&C represents Barclays in related civil litigation. The litigation included class-action suits involving USD Libor, Yen Libor and Euribor alleging violations of federal antitrust laws and violations of the Commodity Exchange Act, as well as violations of the Racketeer Influenced and Corrupt Organizations Act and various state laws. BP, in multidistrict class-action lawsuits involving allegations of a conspiracy to fix the price of North Sea Brent Crude Oil and North Sea Brent Crude Oil futures contracts traded on the New York Mercantile Exchange and IntercontinentalExchange. The lawsuits assert claims under sections 1 and 2 of the Sherman Antitrust Act, the Commodity Exchange Act and state law. S&C successfully represented BP before the Judicial Panel on Multidistrict Litigation in favor of centralizing the actions in the Southern District of New York, where the actions are now pending. British Airways, in two global criminal antitrust investigations and in related multidistrict class-action lawsuits over allegations of price-fixing of fuel surcharges with respect to cargo air services—which was settled—and passenger air services. In both the cargo and passenger investigations, which are among the largest probes undertaken by the DOJ’s Antitrust Division, S&C represented British Airways before the DOJ and coordinated the company’s responses to foreign investigative agencies with U.K. and other co-counsel outside the United States. Cablevision Systems, in a consumer antitrust class action pending in federal court in California. The action challenges as unreasonable restraints of trade, in violation of Section 1 of the Sherman Act, the agreements between all major television programmers and cable and satellite companies on the ground that the agreements require the distributors to offer the programming to subscribers on tiers and do not allow consumers to choose individual channels on an “a la carte” basis. Goldman Sachs, in a number of matters, including a publicly reported investigation by the Antitrust Division of the DOJ and the European Commission into credit derivatives trading and two putative class actions brought on behalf of classes of issuers and purchasers of auction rate securities. The U.S. Court of Appeals for the Second Circuit affirmed the dismissal of both matters. Microsoft, as counsel, coordinating counsel and settlement counsel, in its defense of hundreds of consumer class actions brought around the country by end-users of Microsoft software and direct purchasers of Microsoft software following the Department of Justice’s antitrust case United States v. Microsoft. Microsoft, as trial counsel, in its defense of more than a dozen consumer class actions alleging antitrust damages and business fraud claims, including a seven-week jury trial in Minneapolis, Minnesota, and a 16-week jury trial in Des Moines, Iowa. The Firm also obtained six favorable rulings on related matters from the U.S. Court of Appeals for the Fourth Circuit. Microsoft, in a long-running antitrust lawsuit brought by Novell that sought nearly $4 billion in damages. The U.S. Court of Appeals for the Tenth Circuit unanimously affirmed the district court’s dismissal of the case. The district court granted Microsoft’s post-trial motion for judgment as a matter of law after an eight-week trial that ended in a deadlocked jury. JPMorgan, in more than 40 putative class-action lawsuits in federal court alleging a conspiracy to manipulate the silver futures market in violation of the Sherman Act and the Commodity Exchange Act. The court granted JPMorgan’s motion to dismiss and subsequently denied the plaintiff’s motion for leave to file an amended complaint. The United States Court of Appeals for the Second Circuit affirmed the dismissal. Philips Electronics, in a class-action antitrust multidistrict litigation pending in the Northern District of California and in related worldwide governmental investigations in connection with the sale of thin film transistor liquid crystal display panels. AkzoNobel (Netherlands), in the sale of its North American decorative paints business to PPG Industries (U.S.) for approximately $1.05 billion. Alcon (Switzerland), in connection with the purchase by Novartis (Switzerland) of a 52 percent interest in Alcon held by Nestlé and Novartis’s subsequent acquisition of the 23 percent of Alcon shares held by the public. Bank of Montreal (Canada), in its well-publicized $4.1 billion acquisition of Marshall & Ilsley (U.S.) and its overlapping Midwestern banking business. Barclays (U.K.), in the sale of HomEq Servicing, its U.S. mortgage servicing business, to Ocwen Financial (U.S.) for approximately $1.3 billion. British Airways (U.K.), in obtaining U.S. antitrust approvals for a three-way, metal-neutral joint venture among BA, Iberia (Spain) and American Airlines (U.S.) covering their transatlantic businesses and the subsequent $9 billion merger of BA and Iberia. Time.com reported that the BA and Iberia merger was one of the largest deals in aviation history. CSC Holdings, a subsidiary of longtime S&C client Cablevision Systems, in its sale of Bresnan Broadband Holdings to Charter Communications Operating, a subsidiary of Charter Communications. Cymer (U.S.), in its acquisition by ASML Holding (Netherlands) for approximately $3.9 billion. GETCO Holding (U.S.), in its merger with Knight Capital Group, whereby GETCO and Knight were combined under a new publicly traded holding company. Pharmasset (U.S.), in its $11 billion acquisition by Gilead Sciences (U.S.). New Page Holdings (U.S.), in its pending $1.4 billion acquisition by Verso Paper (U.S.). Nippon Steel & Sumitomo Metal (Japan), in its pending acquisition of ThyssenKrupp Steel USA for approximately $1.55 billion. Optimer Pharmaceuticals (U.S.), in its merger with Cubist Pharmaceuticals (U.S.), whereby Cubist acquired all of the outstanding shares of Optimer common stock for approximately $551 million. Rio Tinto (U.K.), in the sale of its Alcan Global Packaging business in three separate transactions: the $2.03 billion sale of the Global Pharmaceuticals, Global Tobacco, Food Europe and Food Asia businesses to Amcor (U.S.); the $1.2 billion sale of the Food Americas packaging business to Bemis (U.S.); and the sale of Alcan Beauty Packaging to Sun Capital Partners (U.S.), two of which sales involved extensive investigations by the Department of Justice. United Rentals (U.S.), in its $4.2 billion acquisition of RSC Holdings (U.S.).